2 Forgers Anvils, Exciting Tome, Corner Wall Unlocked. 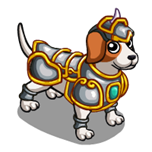 Notes: We got a Puppy Squire from the previous mission. Trials of Chivalry (Maidens, Arenas and Altars) drop from "fishing" at the Frontier Castle. They're healed with 3 of a specific feed, Woo Flute, Jousting Lance or Solemn Oath respectively. They drop from Boring Tomes or Exciting Tomes. All building details are HERE.